Whether you’re a freshman or a senior, experience is valuable. This year’s Internship and Civic Engagement Fair is the prime opportunity to meet and talk with organizations of all kinds, including Wasatch Mental Health, Make-A-Wish, and the Waterford UPSTART Program. The fair will be held at the WSC Garden Court from 9 a.m. to 2:30 p.m. on Tuesday, January 29th. Stop by when you can to learn how you can enhance your time at BYU and talk with various organizations while enjoying free refreshments. Experiential learning means you don’t come to BYU for a degree alone. It means gaining unique experiences you can use in the workplace. Life is integrated; not only are you here to learn in an academic setting, but to learn as you interact with others and discover your own strengths and weaknesses. The Internship Fair is a fantastic way to gain exposure to the needs of the community and find your place within that context. Gordon Smith, a former Oregon senator, is no stranger to the strife of politics, but it is perhaps because of that very strife that he encourages others, particularly Latter-day Saints, to become involved in public service. “I am a witness to the fact that this world needs Latter-day Saints to excel in, not just medicine, not just law, not just business, not just the arts, but also in the art of government,” he said. He said the LDS values are the values that society, though without recognizing it, needs and admires. Ask of your elected officials: “Can you tell me one issue in which you would be in the minority, about which you feel so strongly that you would be willing to loose your office for?” “If they can’t do that, you might as well elect a weather vane,” Smith said. Look for the “heart of the interest”, as many are motivated by a monetary interest. To make sense of politicians, watch how they run their campaigns. They will often govern how they campaign. Be wary of politicians who say that they are running because “its a natural extension of my service,” because that is self-centered, which is an antithesis of public service. He also warned against those who want to run government like a business, because it is not about a return on investment. It’s about writing rules that gives everybody a chance. Divide politicians into two groups: noisemakers and deal-makers. “It’s very difficult to be both,” he said. Noisemakers give the media what they want, and they make a lot of enemies, but they are needed because they set boundaries. Deal-makers are needed because they make things happen. Holly Richardson, who spoke at a September 2016 Civic Engagement event, also provided these suggestions. Learn to communicate clearly and concisely. “Be able to answer why you are running, in 30 seconds or less,” he said. Develop a conviction. Smith said the best advice he was ever given was to develop an opinion, through thorough research, and to write it out and and say it over and over, and that will help him develop a conviction. Believe in something and fight to defend it. Learn leadership. “You can’t be the jack of all trades,” Smith said. Respond softly to vulgarity. “It will elevate and inform and protect you,” Smith said. Do not forget the importance of honesty and integrity. These are your cornerstones. Smith said that people should be able to trust you, even if they disagree with you. The United States Senate influences the rest of the world through example, said Smith. The Bill of Rights and the Constitution are the greatest “exports” this country has. “We’re not a perfect nation, but we’re a good nation,” Smith said. “As long as we live up to the values of our founding documents, there is much good in the world.” For things that have a huge impact on many people, like Obamacare, both parties need to agree through compromise because things passed this way will last longer. But compromise can be very hard to achieve. It was one of the hardest things he was involved in during his time in the United States Senate. What helped him was having a supportive family, because it was hard work, and meeting young people. “During my time as a senator, I delighted meeting with young people,” Smith said. They always asked Smith if he represented their ideas or his. Smith said he had two roles, one as a delegate and the other as a statesman. “Many people are dreading this year’s election,” says Dr. Richard Davis, director of BYU’s Office of Civic Engagement. “Even though this presidential election has more high profile candidates than any election in the last century, there is widespread dissatisfaction with the choices.” The ability to vote can perhaps feel more like a burden than a privilege, but there are many benefits of voting, both to the country as a whole, local government, and the voters themselves. In fact, voting is associated with better social connections, health outcomes, and lower unemployment, according to Nonprofitvote.org. If you want to be involved, but worry that you don’t have the time, knowledge, or resources to make a difference, know that you don’t have to fix all the problems, but your help is needed to improve in your sphere of influence. Next week, Provo’s mayor, police chief, and economics director will come to campus to hold a panel on how Provo residents—students and otherwise—can get involved. The discussion is hosted by the Office of Civic Engagement, an FHSS entity. Police Chief John King started leading the force in 2013. He is dedicated to protecting the community and doing it in a respectful, honest, and excellent way. Bring your questions to this panel. The discussion will also be an opportunity for you to ask them. The Office of Civic Engagement also has a list of dozens of local engagement opportunities, including jobs and internships. What challenges keep you from being locally involved? “People often say that, in a democracy, decisions are made by a majority of the people.” Walter H. Judd once said. “Of course, that is not true. Decisions are made by a majority of those who make themselves heard and who vote — a very different thing.” Our own Dr. Earl Fry specifically addressed the need for our generation to vote in an October 2015 Twitter chat. On September 22nd, our Office of Civic Engagement will continue the conversation by talking about why all votes matter. It may easily be argued that this upcoming presidential election, more so than any other, is of paramount importance. With such polarizing candidates, every vote matters. Of this, Ms. Cogswell said, “When talking politics, I’ve often heard people say something like, ‘It doesn’t really matter if I vote, I’m just one person. What difference would it make?’” This is exactly the kind of mindset #AllVotesMatter hopes to combat. Holly Richardson, a political activist, dynamic speaker, blog writer, social media consultant, small business owner, and a Republican. It is hoped that Mrs. Richardson’s words will inspire students to vote. However, #AllVotesMatter is not the only way in which the Office of Civic Engagement is hoping to rally students. At 3pm on September 20th at the WILK Garden Court , they are hosting a Political Involvement Fair where various party representatives will answer any questions students might have. Additionally, there will be a Voter Registration Drive on both September 27th and the 28th at the WILK (inside and outside). Within a few minutes, you can be registered to vote! All votes matter. When you’re talking with someone, don’t you like it when they hear you? Why should this, the choosing of the president of the United States, be any different? So, don’t forget to go the seminar, don’t forget to vote, and remember: #AllVotesMatter. Will You Step Up to the Plate and Vote? A life dedicated to the service of others fills a man with valuable wisdom. And Pastor France Davis’s life has indeed been one of service. He participated in many demonstrations during the civil rights movement and has served as a Baptist minister in the Salt Lake area for decades, playing a crucial role in the community as a leader and activist. So The Office of Civic Engagement has invited Davis to share his wisdom and speak on being a force for good in the community. So join us for this wonderful opportunity Thursday, Jan. 21st at 11 am in the Varsity theater. Are you keeping up with politics? According to a recent Pew Research Center Poll, 10 percent of Americans fall into the category of “politically disengaged.” For millenials—voters under 30—that figure is much higher. The New York Times pegged their percentage of disengagement at closer to 61 percent. The subject of why we should care about politics, when so much seems to be going wrong, was a subject of discussion at our recent Twitter party and at a presentation given by Provo Utah Mayor John Curtis. If you feel disengaged in politics, here’s a chance to change your ways and learn about why you should care. 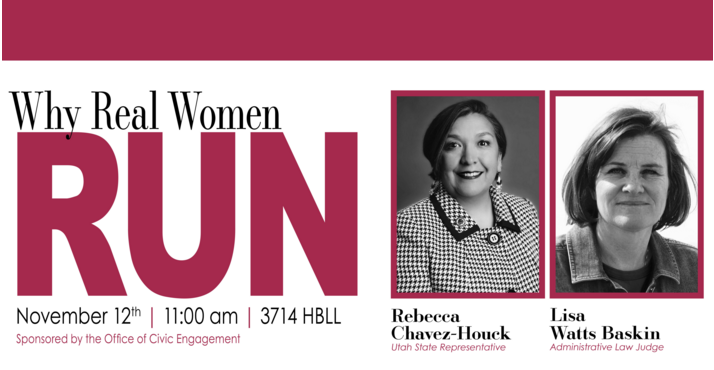 On Thursday, November 12th, two Utah elected officials, Rebecca Chavez-Houck and Lisa Watts Baskin, will be on campus to speak about the importance of participation in electoral politics, particularly the participation of women. Real Women Run is a collaborative, nonpartisan initiative. Their aim is to encourage women to participate fully in public life and civic leadership, whether that means simply being informed about the American political system or running for a political office. This event, sponsored by the Office of Civic Engagement, will focus on the advantages and challenges of women participating in electoral politics. Get to know your elected officials. Educate yourself about candidates running for office. Rep. Chavez-Houck has represented Salt Lake City’s District 24 in the Utah House of Representatives since 2008 and focuses on public policy related to health and human services as well as voter engagement and access. Ms. Baskin has practiced law in Utah for nearly 25 years and presently serves as an Administrative Law Judge in the Utah Office of Inspector General. She also practices law in her own firm. She serves on numerous civic boards and commissions. Visit RealWomenRundotorg.wordpress.com for more information on. Sponsored by the Office of Civic Engagement. Are you politically engaged or disengaged? What is “engagement,” and what does it mean in the context of BYU? Webster’s New World College Dictionary defines it as “emotional involvement or commitment.” BYU defines it by providing a whole minor that “provides students and faculty with the appropriate skills and meaningful opportunities to become engaged in their respective communities. We seek to promote civic service and to encourage everyone to find ways to solve the problems around them.” In short, we, as a university and an FHSS college, want you to get involved emotionally involved in your community. Why? Because there are so many things to care about, and so many ways to be engaged in addressing them. If you care about family integrity, the state of the roads in front of your house or on your way to work or school, or being able to find or keep a great job, you are emotionally involved. 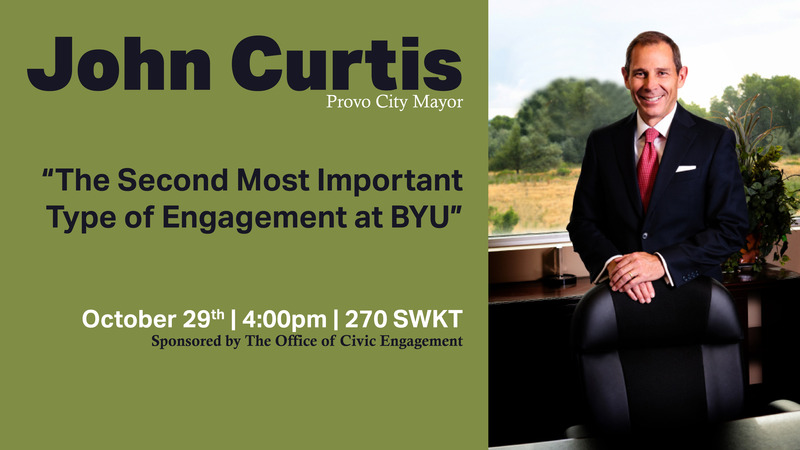 Find out how to be engaged in positive actions regarding those things, or learn of other topics about which you might want to get involved, at a talk given by Provo Mayor John Curtis on October 29th from 4 to 5 p.m. in 270 SWKT on the BYU Campus (on the main floor of the Kimball Tower, the tallest building on campus. He will speak about “the second most important type of engagement at BYU.” Parking is available to the north and east, if you are an off-campus visitor, or to the west and south if you’re a student (see this campus map for details). Mayor Curtis began his first term in office in 2010. During his first four years, the city of Provo ranked #1 in the nation for business and careers by Forbes as well as #1 for well-being by Gallop, according to the Provo city website. The city also received national recognition for quality of life, family environment, and a rising tech and entrepreneurial environment. With the help of the City Council, employees, and residents, Mayor Curtis’ administration brought Google Fiber to Provo, regularly scheduled air service at the airport, expanded parks and trails, and completed Provo’s state-of-the-art recreation center. Mayor Curtis was a businessman before becoming mayor. Are you trying to master the art of being involved in you community? Then the Office of Civic Engagement invites you to be their guest during the Civic Engagement Research Conference on October 15th from 9:15 am to 7 pm in the Hinckley Center third floor conference room. You can help them fulfill their mission by participating in the discussion. The conference will feature presentations by faculty and student researchers on civic engagement in various disciplines. Several of our students at FHSS will be presenting. How to best make a difference in your community. How to recognize and overcome challenges related to civic engagement. How to become involved at a young age (and how to help children do so). You can read the speaker & student bios here. We urge you to attend the conference panels throughout the day. All presentations are open to the general public. Civic engagement is a balancing act. And BYU’s Office of Civic Engagement is here to help you find that balance. Come learn how to get involved! Feature image courtesy of Flickr.